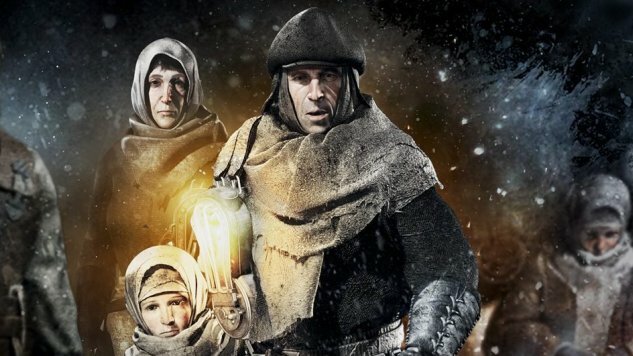 Frostpunk centers on a fundamental survival game question: what would you do to survive? Unlike other survival games, and especially in distinction from other strategy games or city builders, it gives you the tools to pursue an answer to that hard question. The game’s world is covered by snow, dominated by a lack of resources, and constantly pressuring its denizens into more and more desperate circumstances. You’re their leader, and you can help them live through this nightmare. What will you do to make this happen? And, even better, how do you keep them from despair and defeat? Frostpunk forces you to care about people. While resources like wood, metal, food and coal bob up and down in the wax and wane of the cold, your people remain steadfast. There is a finite number of them, and you only rule so long as they don’t overthrow you. Your two metrics of how well you are doing, a red gauge called Discomfort and a blue one called Hope, are your best ways of understanding how they are doing in a gameplay-oriented way. You live or die by those two colorful bars. They tell your future. Like Dead in Vinland, another game that synthesizes several genres of simulation and building, Frostpunk is constantly trying to drive home the idea that what people think and how people interact with their world is just as important as top-level things like policy statements and architecture. We’re now in a world of gameplay complexity that, at least to some degree, has left some games that I love in the dust. Compared to Frostpunk, SimCity and Cities: Skylines are basically just freeform city creators that ask very little of the player (and I say this as a fan of those games). It’s not that they’re “light” games, but that Frostpunk is so heavy. That weight centers on those people and their bars of emotion. Frostpunk is trying to drive home a reality that anyone who studies infrastructure or technology will tell you. There are very few problems in the world that are purely technical, solvable by math and engineering, and there are millions of problems that exist at the point where humans run into those technical things. In Bruno Latour’s book Aramis, which tells of the “murder” of a French public transit system, he quotes an engineer named M. Petit. Petit explains that the problem with public transit is as much about acceleration and deceleration as it is about the actual moving. “You always get in trouble with the little old blind lady with the heart condition who gets her umbrella stuck,” Petit says. “You always have to take her into account.” A train could move much faster if not for that woman, and the sexism and ableism in the quotation both point to the fracture between the pure math and the applied reality. Technology like a train could operate in a pure optimal state if not for real humans, who are never “optimal” and always diverging from norms. Most strategy games implicitly take the stance that Petit is explaining there. Humanity is itself with all of the sharp edges filed off and all of our difficulties eliminated. There’s very little room in Cities: Skylines to model the real-world effect that someone with a stuck umbrella would cause. Frostpunk is committed to those human effects, though. Early in the game you are given the opportunity to make a choice between longer-term care for frostbite victims or simply amputating their limbs. This, in turn, creates a number of people who are lacking limbs, which renders them unable to do some of the jobs that they were able to do before. You can research prosthetics, or you can create Care Houses that provide for them. Each of these people is simulated to some degree, and each of them matter in your sub-100 person crater that houses the remainder of humanity. This person, what they can do in the world, and what you as a leader do for them are all taken into account within Frostpunk. How you treat the figurative old woman with the stuck umbrella matters in this game. This surfaces to the player in the form of those red and blue bars. Are you taking care of these individuals and their needs? Do your policies help them imagine a future where they are surviving and thriving in the snowy wastes? Frostpunk asks you to take on the big questions, and then does a reversal on you to show you that those big things are always emanating from something smaller, more human, and specific.